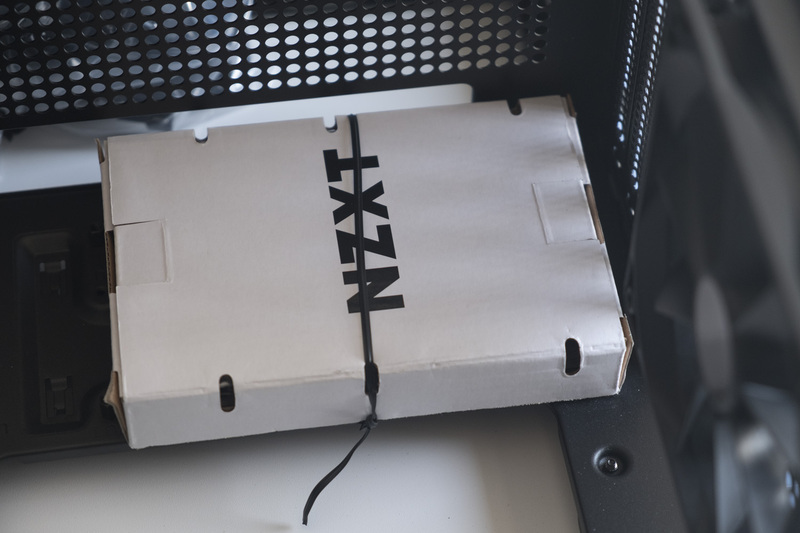 Today we’re looking at a new generation of NZXT cases, which combine the company’s penchant for clean and stylish industrial design with modern features and technologies. There are three options to choose from here: the £130 H200i for mini ITX, the £150 H400i for micro ATX and the £200 H700i for full-size ATX motherboard systems. The case we have in to review today is the middle child, the H400i, in a beautiful white colourway. With the background out the way, let’s take a quick look at the features and specs before getting into our hands-on overview! 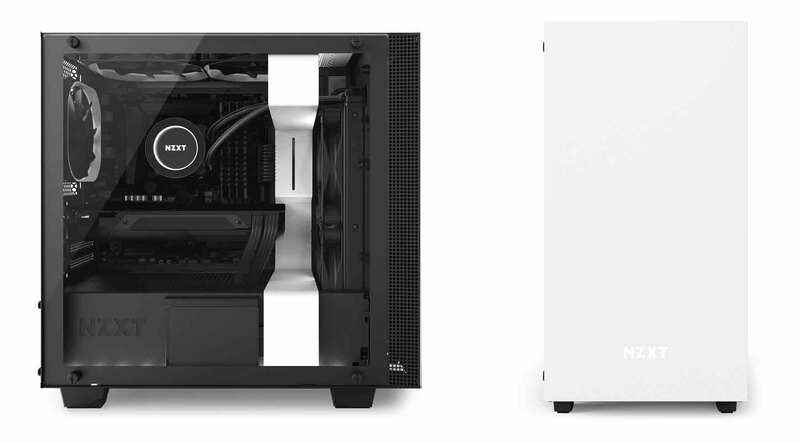 In my memory, NZXT have always been associated with beautiful white designs. 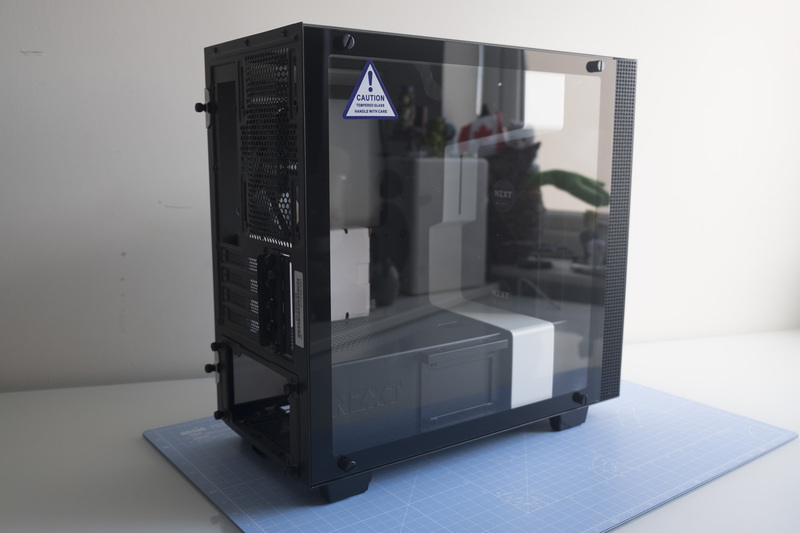 I picked up my first NZXT case, the Phantom, all the way back in 2011 with my first ever paycheck after graduating from university. I loved the asymmetric design and unique prow, which really set it apart from the leagues of black boxes on the market. Since then, I’ve owned (and enjoyed) later Phantom designs, the cutely rounded Manta, the sleek yet boxy H440 and the glass-bound S340 Elite — and all have been available in that same eye-catching polar shade. The H400i doesn’t buck the trend for eye-catching colours, with a white option getting first billing alongside matte black, red and blue colourways. 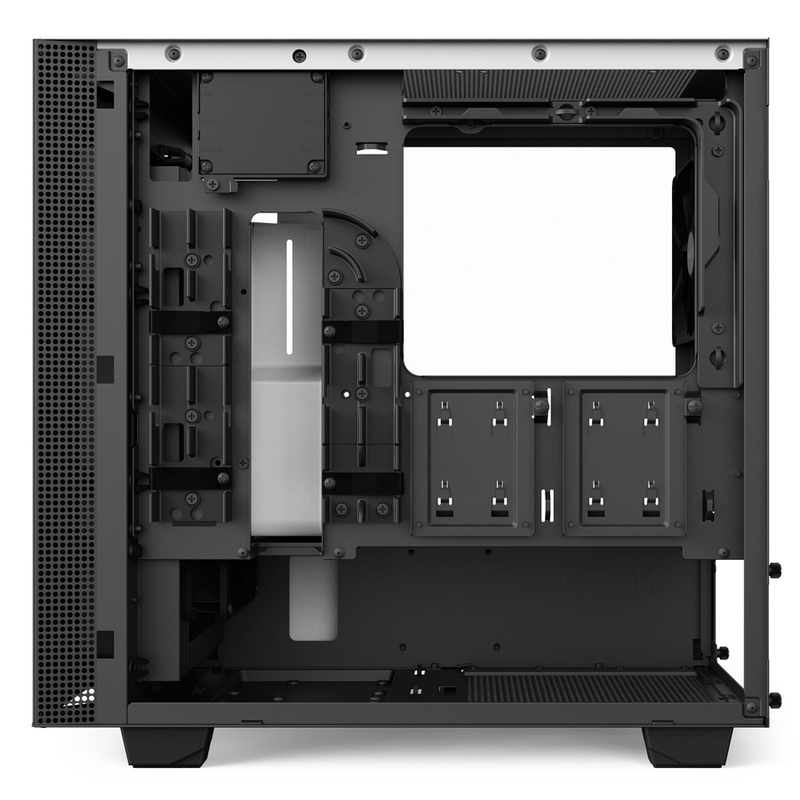 Where it differs is the design, which is sharper and starker than most of the NZXT cases that preceded it. Let’s take a closer look as we go hands-on! 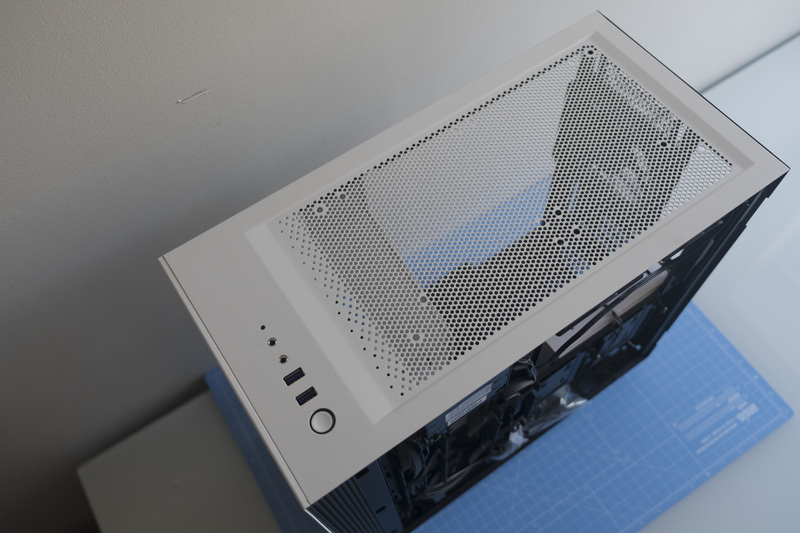 Part of the reason for the new, boxier design is down to the H400i’s use of a tempered glass panel on one side. The panel is held in place by four small thumb screws, in one each corner. The glass panel looks fantastic, and should be a good way of showing off all of the shiny new LED-lit components you’ll be putting inside. You can see ventilation along the front side of the case, running from top to bottom on the right side of this picture. The other side isn’t glass — it’s steel, in a fetching shade of white. This panel is held on by two thumb screws on the rear; once removed, the panel can be levered away at the rear before disengaging the latches at the front. 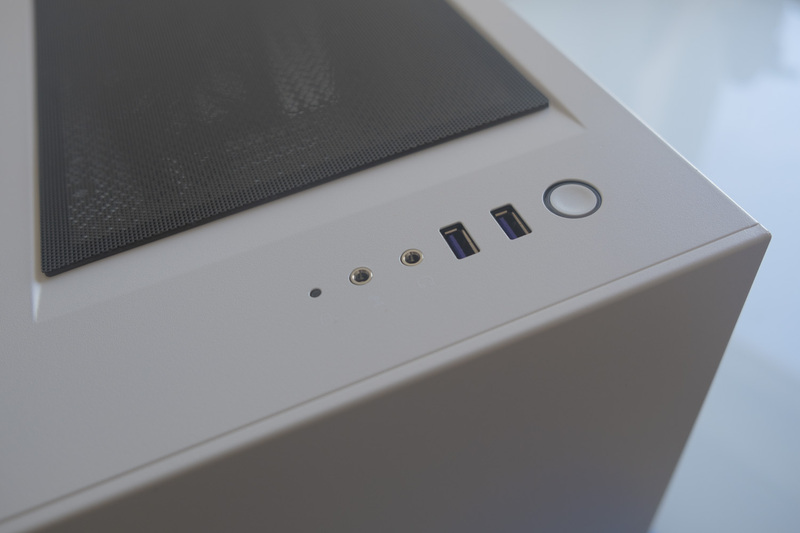 Together with the white top and face, you’re left with a sleek and elegant design; again note the ventilation running the full height of the case at the front. At the top, we have our usual I/O options: two USB 3.0 ports, in a nice purple colour, two 3.5mm audio ports, a circular LED-lit power button and an HDD indicator light. There’s no HDMI hookup or additional USB 2.0 ports as we saw on the S340 Elite, so VR users will need to hook up their cables in the back as normal. 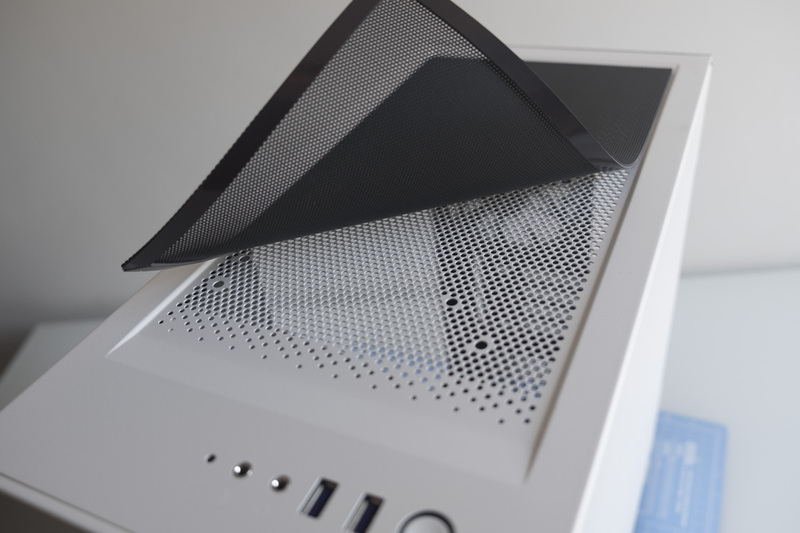 The top of the case is covered in a fine mesh, which is flexible and easily removed for screwing in fans or radiators; it also makes cleaning quite straightforward. Here’s what the top of the case looks like with the filter completely removed. 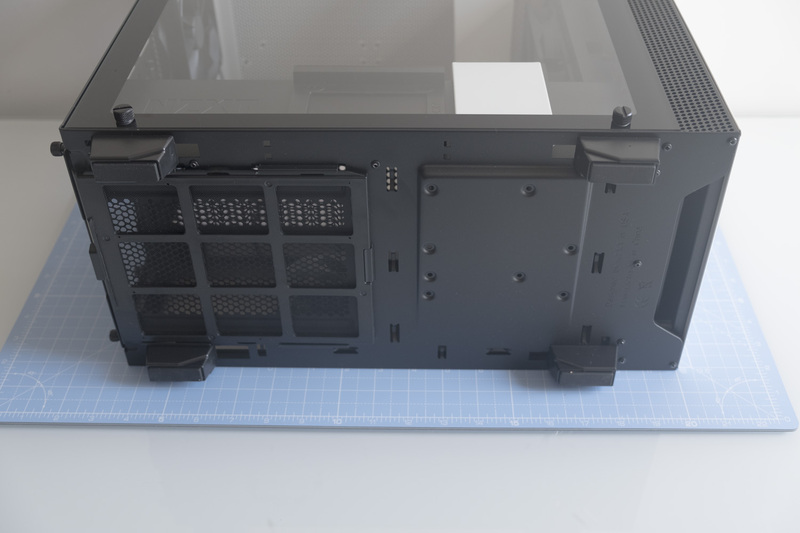 The bottom of the case has four feet, each with a good-sized chunk of rubberised material to prevent your computer sliding around. There’s also a filter here, which can be moved out of position by pulling a tab near the back of the case. Inside, there are plenty of interesting features to mention. 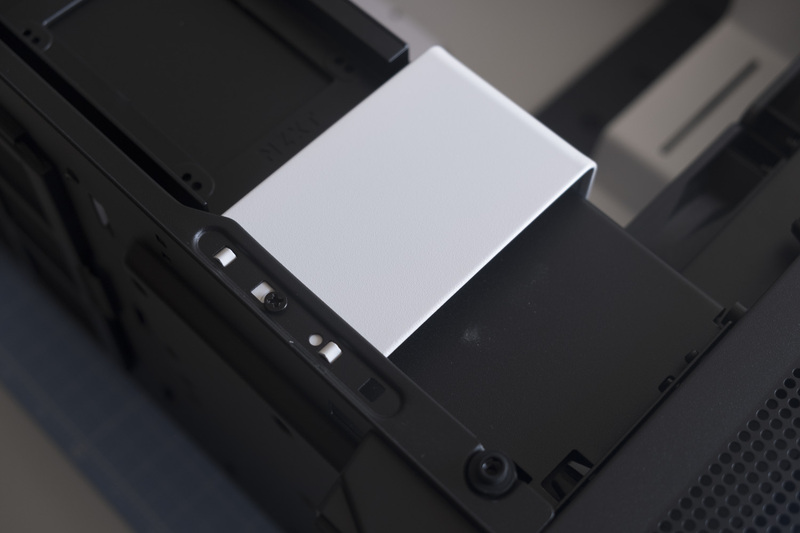 First up is this 2.5-inch drive tray, which can be removed, rotated and repositioned by squeezing the lip near the top of this photo to release the mounting pins. 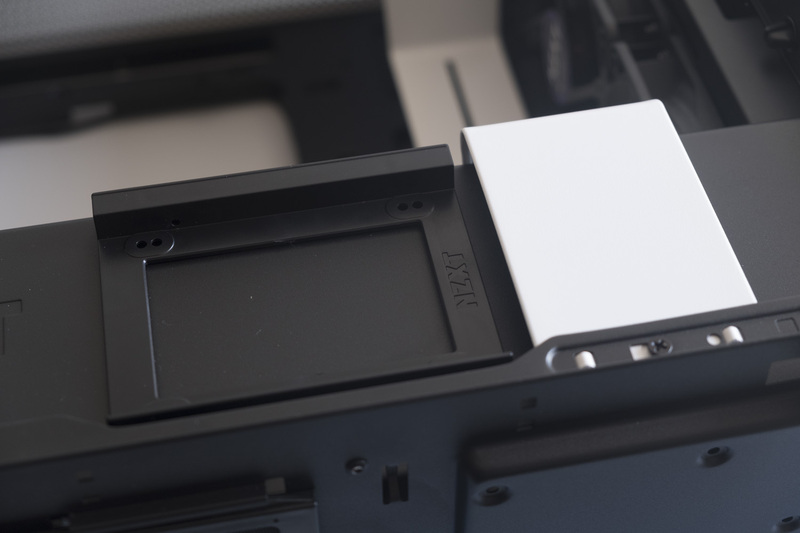 You can see the bottom of the drive tray here, which features a choice of two mounting positions for your SSD. 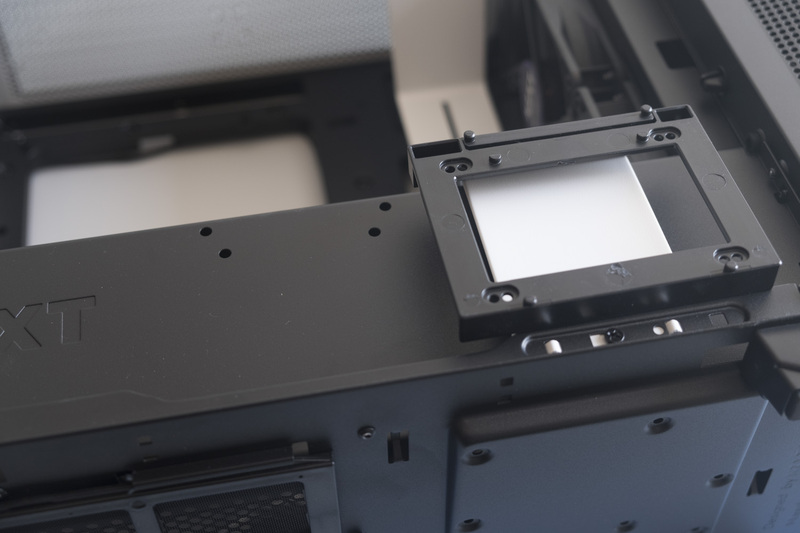 One of the most interesting features of the H400i is the white bracket, intended for use with radiators up to 280mm in size. If you prefer not to use the bracket, you can remove it simply by unscrewing a few screws on the front and back. 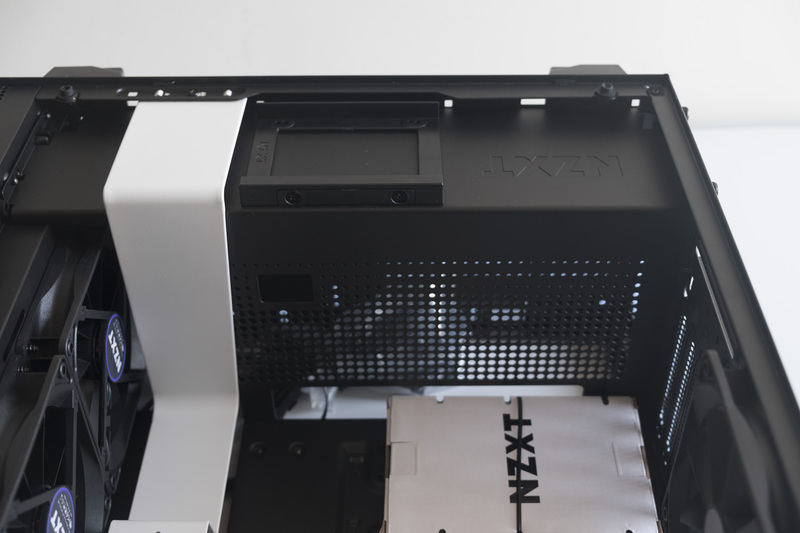 As with other NZXT designs, the PSU is shrouded so you can hide away all of your messy cables within the lower section of the case. 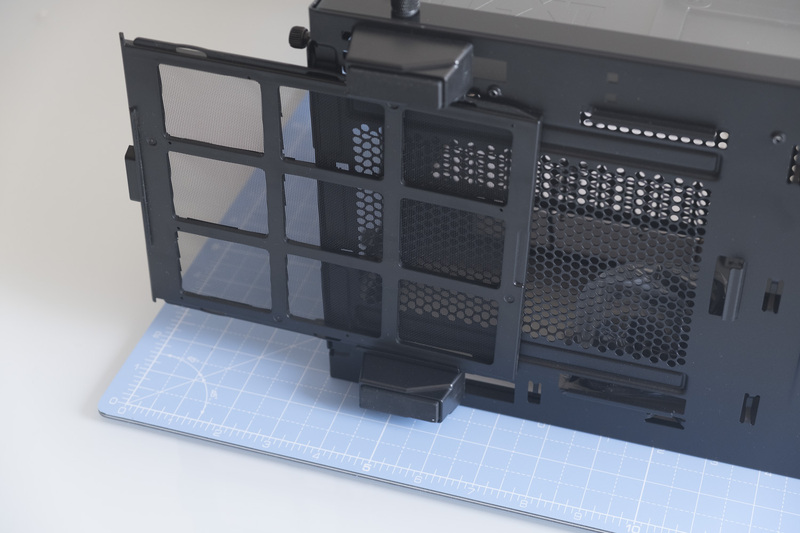 The H400i includes a grid of circular holes in the shroud, which should improve airflow and maybe even allow for RGB lighting to peek out (if your PSU happens to be RGB LED-encrusted). 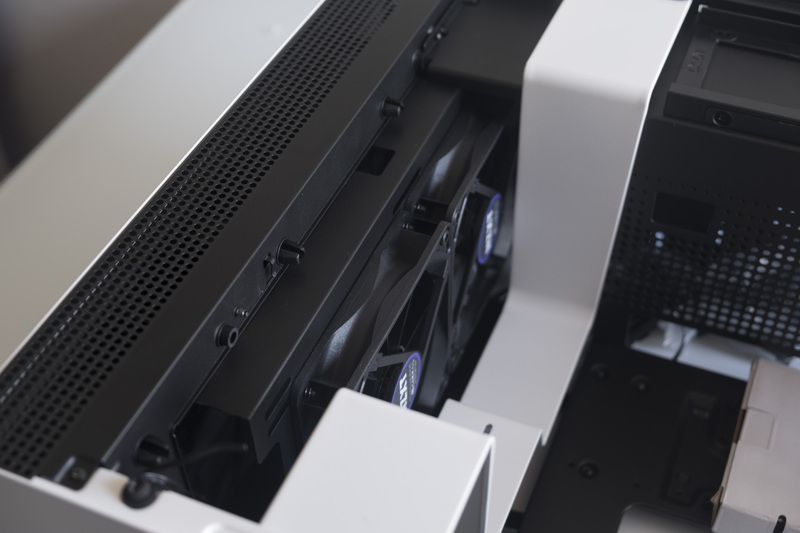 The case also includes three of NZXT’s own Aer F 120mm fans; sadly these lack the RGB lighting found on the Aer RGB. 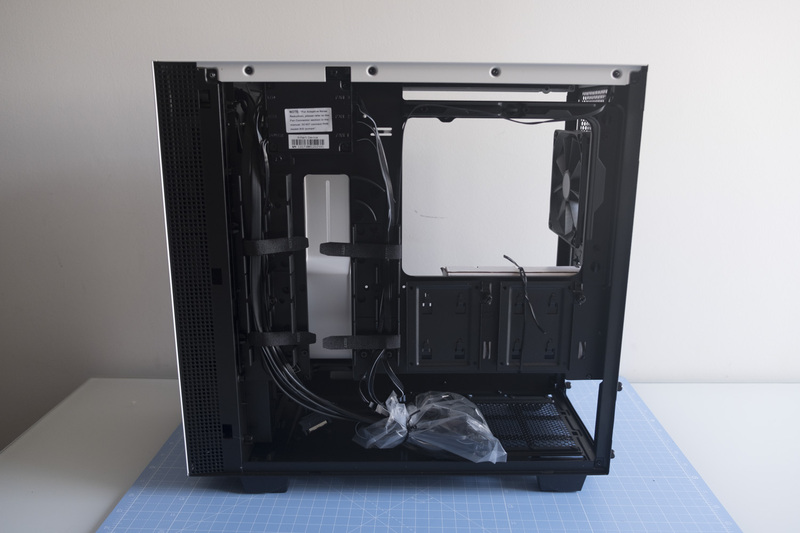 You’ll find one 120mm fan in the back, and two up front, so air is pulled from the front of the case and then pushed out the back and top. 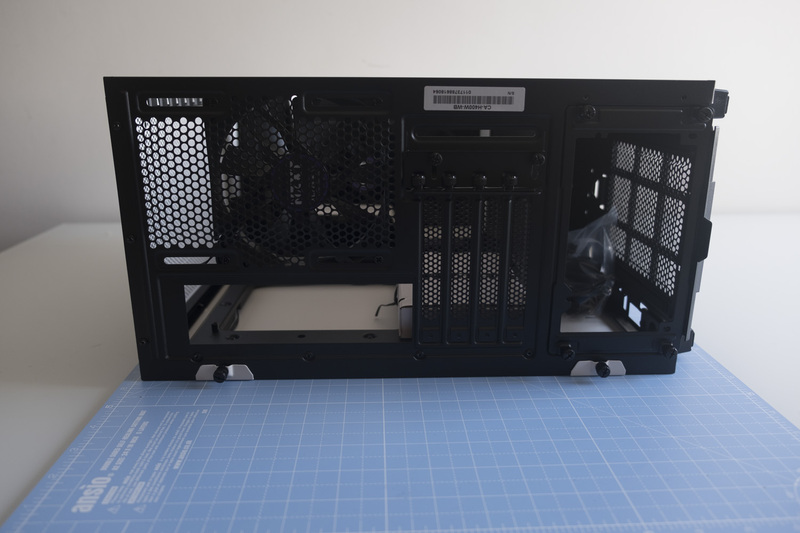 The H400 comes with a white cardboard box strapped to the inside of the case, just above the PSU shroud. Inside the box, you get a manual, an addendum to the manual, zip ties and an RGB lighting strip (one is pre-installed). Here’s a view of the back of the case; you can see that almost every surface is perforated to allow for heat to easily escape from the back of the case. 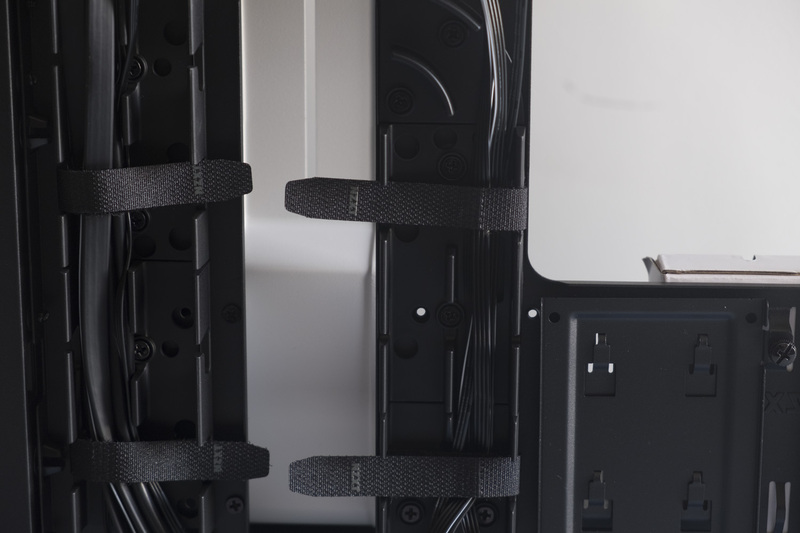 From the right side of the case, you get a better sense of the H400i’s cable management. You can also see that you get full access to the back side of the motherboard, which is great for these smaller boards that often put important features like the M.2 SSD slot back there. Let’s take a closer look at the cable management situation. 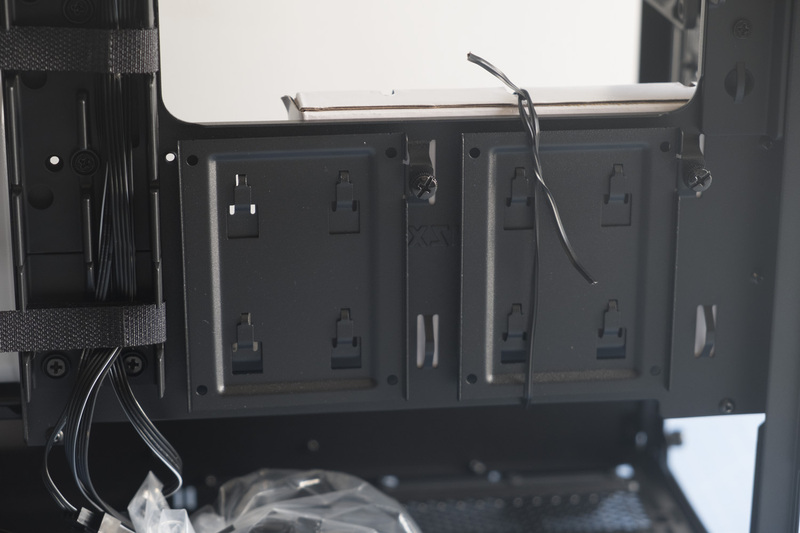 As you can see, there are four velcro ties here, with the case’s cables already routed through to give you an idea of what you might want to do as well. There are four channels in total for you to use, two pairs, which means even thick cables like the motherboard’s 24-pin power cable won’t take up all of the available space. The photo we had previously is a little dark, so here’s what it looks like without the cables in position. Note the Smart Device at the top left of the photo, which gives you a single location to plug in your fans and RGB strips. Below the motherboard aperture, you can also see two further 2.5-inch drive bays which can be removed as necessary. 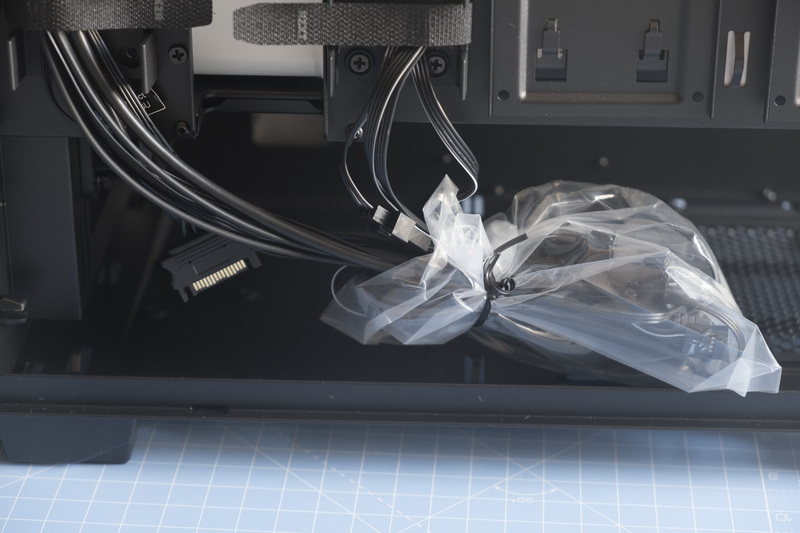 The cables terminate in a neatly wrapped plastic bag, ready to be plugged into your power supply / motherboard. That just about covers everything, I think! To sum up, the H400i is a modern case that adds some interesting new features while maintaining the company’s distinctive style. 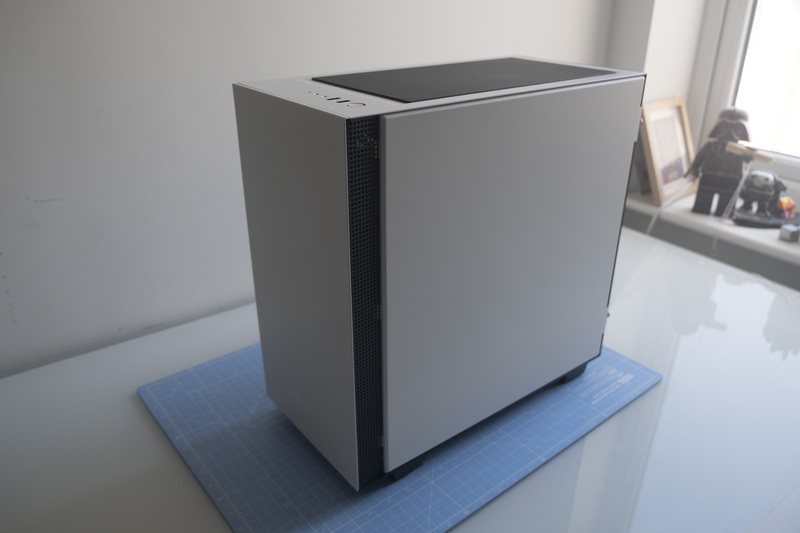 It’s quite big for a Micro ATX case, and which should make for a comfy installation. The Smart Device is a sensible upgrade to the fan controller that’s been included in NZXT cases for years, and the continued efforts to appeal to water cooling users (e.g. the removable radiator bracket) will surely be appreciated. Cable routing also looks quite good, with plenty of space so cables can be routed logically and neatly to avoid a spaghetti junction situation. 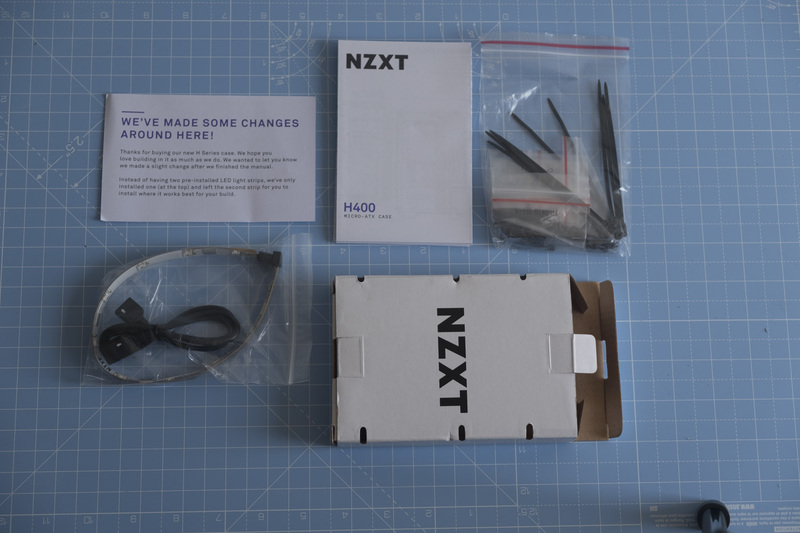 Thanks for checking out our initial overview of the NZXT H400i. It’ll be interesting to see how the case performs in terms of noise and heat, as the combination of the Smart Device and CAM software could be a potent one. We’re looking to get a system to put into this case to test it out completely, but we hope you’ve enjoyed this quick look at the H400i’s design and features for the moment!